The Walker Blog: Where Inspiration Meets Conversation . . . . Whenever there is a flash animation on the top of a web site, I hardly ever take it in. 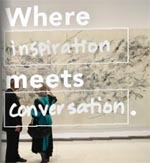 As I watched the marketing slogans cascading slowly across the splash page of the Walker Art Center's Web site, the line "Where Inspiration Meets Conversation" made me pause and think before I started clicking. What a great slogan for a blog! The Walker is one the pioneers in the field of art and technology or digital art. Back in the very early 1990s, it was one of the first larger arts institutions to have a web site while many others in the arts field were still saying "World Wide What?" So I wasn't surprised to see a link to "Walker Blogs ." So far, there are two. one maintained by the New Media Initiatives department and the other by Community and Education Department. After some email with the webmaster, I was able to track down Reggie Prim, Community Arts Program Coordinator to learn more about the Walker Blog. So, here's my first "Bloggerview"
Why did the Walker start a blog? I think that in my own departmental case, the head of the department wanted an extra way to tap into all the things I was doing in the community. While I jokingly say it it was a way for my boss to keep better track of me, the blog also gives me a way to share some of the interesting things I was coming across in my research on arts and community with other staff members and our audience. How was the idea received within the organization? What did leadership think of blogs? The idea of blogging came from the leadership. The director of the education dept said, "I've got a great idea! You should have a blog." Then, using her organizational magic wand (the use of which I have not been initiatied) she made it happen and said "Go, forth and blog!" Well, not exactly. Other staff members in my dept also have the ability to post but they don't see the value and don't want to take the time. I suppose once there is some traffic and the blog gets cited they'll come around. I try to get them to post interesting stories or links and they haven't really picked it up yet. Since your blog is an organizational blog and not a personal one, do have any particular organizational guidelines you must follow? I feel pretty free to post whatever is interesting that I find. Although I want to advance a more focused approach that talks about what we are doing in the department. It¹s a balance of interesting links and things about the department. The other Walker blog really focuses on the intra-departmental experience and I think that can provide readers with a look inside the organization. For me it¹s a window to another side of the organization. We have a pretty hefty process to get anything published at the Walker. The blog is an unfiltered view of staff concerns, interests. It allows me to advance ideas that I can later develop into larger written pieces. In the future it will also be another way to get the word out on our projects and programs. One of the big challenges is having your colleagues coming up to you and teasing you "Oh, you're blogging again." As if its some sort of play. But its time consuming and can be tedious. Because we don't have that much traffic yet the value isn't really appreciated yet. And, thank you Reggie for sharing your thoughts about blogging! Lisa Meyers Brown responded to my question to her about her observations of the state of blogging by nonprofits. I'll try to be focused here by simply saying that the nonprofit world is seemingly in a place of exploration, as are many for profits. We're not sure how to use blogs most effectively, the ROI, how to strategically integrate ourselves into the medium given the "rules" of blogging, and even more, how to genuinely integrate ourselves into the conversations about cancer that are already going on without us, etc. There are still far many more questions than answers at this point. When I talk to my for-profit clients about blogs, one of the main ways I tell them that a blog might help their marketing efforts is to build on an existing community of users or interests. Non-profits typically have such a community going into the game, so the question becomes how can the blog enhance the effort, and who should blog. What I will be talking about at BlogHer is the idea of getting your customers to do the talking on the blog. The same might work extremely well for a non-profit. "Disclaimer: We are pleased to provide a forum for sharing, and remind everyone that the viewpoints, opinions and actions expressed here are those of the individuals themselves, and may not reflect March of Dimes policies or positions. Information on this site does not take the place of guidance from your health care provider. Always verify information with your health care provider before taking action. Any messages or stories shared on this site may be used in other March of Dimes marketing activities." In my mind, I was making a connection to online communities and codes of conduct and the many articles on Full Circle's web site on this topic. 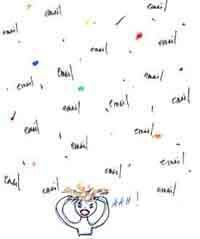 And, then I saw this in my reader from Nancy White's Full Circle Interaction Blog. Last week I posted about Dave Gilbert's experiment with podcasting "unnofficial audio guides" at Moma, a project called "Apologia: We love MoMA. Hackers hack a platform out of respect for it." This morning, Dave Gilbert emailed with a link to the NY Times article about his project. Way to go Dave! These audio guides were inspired by a recent podcasting trend called "sound seeing," in which people record narrations of their vacations so others can enjoy. The use of podcasting has many implementations for museums. For starters, podcasting can liberate art lovers from the museum's clunky audio sets and enjoy the Museum's "Official Audio" more stylist piece of equipment. It can also liberate museum goers from hearing one view - that of the expert or curator. As demonostrated by this project, podcasting can also facilitate visitors creating their own guides and tours. Which is something a musem would want to embrace, right? That people have engaged so much with the art that they would be movitated to create their own audio guide and share with others, perhaps people who have never set foot inside the museum before. This could help boost attendance and help break down the elitist or "its not for me" perception that may keep people from coming through the doors of the museum. I wondered how the institution views the project. The article states: "Informed about the project last week, museum officials declined to reciprocate with their opinions, but also made no comments about instituting an iPod ban." Hmm, if they institute an iPod ban, would it be a violation of free speech, elitism, or just be stupid marketing ....? You can download and listen to some of the podcasts on Dave's site and even contribute your own. One other example of museum podcasting: A New York art Web site, woostercollective.com, recently made a sound-seeing tour of the Jean-Michel Basquiat retrospective at the Brooklyn Museum, which the Web site's creators made in hushed tones while wandering through the show, sometimes quoting from the museum's official audio guide, which they listened to as they chatted. is not only thinking about the possibilities, but setting up some action learning. Let's watch all this closely. textually.org: Mobile Active Convergence: Looking for a few Mobile Organizers via network-centricadvocacy. NGOs Green Media Toolshed and aspirationtech.org - who's motto is "better tools for a btter world" - are hosting the first-ever gathering of activists and organizers using cell phones and sms in their campaign, human rights, and political work. They are still looking for experienced campaigners, human rights, and social justice activists who are using sms messaging and cell phones in their work. The "MobileActive" convergence, to be held in Toronto, Canada on June 23-25th, will develop guides and best practices for campaign planners and technology staff. Some post-dinner random browsing and I found this wonderful example of teachers sharing their lesson plans via flickr. My questions: Is there a way for nptech folks to share their practice working with clients via flickr? By way of Global s Online, a Google Bombing campaign to change the online image of women from the Philippines and take back the keyboards flipina and Philippines. It got started by Milky Soft's post "Filipina and the Philippines"
Wonder if any nonprofit organizations have used this technique? Update: I fixed the link to Filipina and because the recent trackback suggests linking the word Filipina as many times as you can. I'm adding the word, Filipina again. A couple things about this article "Cambodian ex-monarch joins blogger community " in the Taipei Times caught my attention. 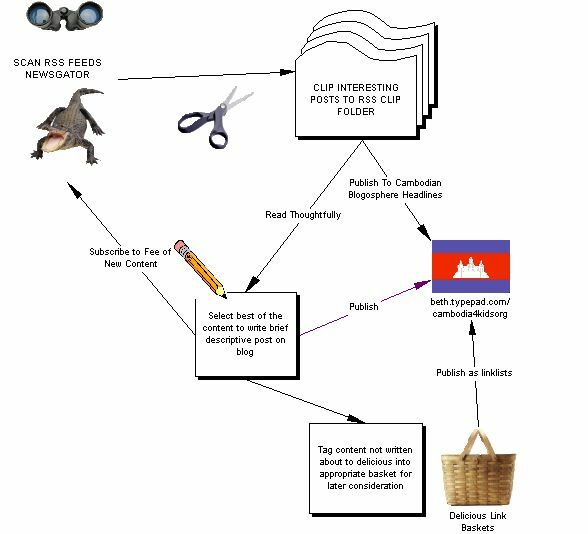 The King's Royal Blog (which is written in french, english, and Khmer) and ability to make the article into wikipedia links. Tagging is Fabulous! Tagging is Crap! The session begain with an overview of some of the familiar services that are using tagging. There was also a look at the differences between spurl, furl, and delicious in terms of clusters, related tags, bookmarking widgets, private tags, etc. Tagging will probably bring back standard taxonomists and make work for taxonomists. You won't see people holding signs that say "I'll tag for food." No conventions have sprung up around tags, although it would be useful for places names so you know whether the tag "Watertown" refers to "Watertown, NY" or "Watertown, MA"
The founder of delicious didn't want to use "popular tags." Main reason is if the tag are going to be useful to YOU - the tag should express your way of thinking not the majority. However, the benefit to exposing the popular terms is that a taxonomy emerges from the bottom up. A great example of a folksonomy is ebay - where a laptop is a notebook. A tool I hadn't seen was Zniff.com which is a search engine based on spurl tags - lets you do a search on the content of web pages. Update: While researching for context on another topic, I came across David Weinberger's notes from a Berkman session called "Why Tagging Matters." Nonprofit Blogs of the World Unite! Last week I asked "Where is the nonprofit blogroll?" and in the comments section, Marnie Web left a quick response pointing me to npoblogs.net and some history . Yesterday, I was delighted to see that Marnie Webb posted step-by-step instructions on how to add your nonprofit blog to npoblogs.net . (This was on my to-do list). It is being maintained by Ruby Sinreich ( be sure to read her blog entry about her presentation on community blogging). Marnie adds: "Eventually the NPOBlogs.net site will be the go to place to find nonprofit weblogs and (I hope) include ways of generating lists of nonprofit blogs." and have all of us add it to our side bars (I might need some help with how to do this with typepad ...) and when we discover a nonprofit blog, post a comment with a link to npoblogs.net. Looks like Arts Wire, the next generation! By the way, Arts Wire was the original artist online network. Launched in the early 1990s using a text-based conferencing system (think the Well for artists), it didn't quite make it. As one of the staff members of that project for many years, I'm delighted to see these virtual artists communities continue to survive and thrive. Greg also has an excellent post on blogging in the arts. I'm glad because I've started to poke around and try to find some. My finds so far are in my delicious account with the tag "artsblog"
I've been researching typing skills curriculum for young children for an after-school ctc. As the students learn a letter name and sound, they learn the correct finger to use to type it. 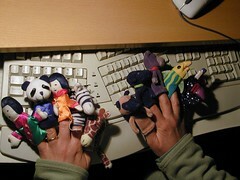 As the child becomes more confident, you can call out a finger puppet name and gauge how well the students did by their responses to the question, “What letter did you get?” or ”What word begins with that letter?” Later on you can give a series of fingers and ask, “What is the mystery word?" I hunted and gathered some choice links my delicious account. Tip of the hat to Michael Stein for pointing out this new white paper by Exponent Partners, Paul Hagen, called "Salesforce Nonprofit Opportunity." Normally, my eyes would have glazed over, but the recent thread, "What's in Your Tool Box?" has been inspiring one or two nonprofit technies to share their list of tools. All this was inspired by Michael Gilbert's article sharing his publishing tools and workflow. Update: Marnie Webb just shared what tools are in her tool box. The presentation is excellent -- I like how they defined blogs and gave many examples -- I just combed through the blog definition and selected a few below, but the presentation is well worth reading through the slides. Russell said he'd rather be a blogger or podcaster, maintaining a relationship with readers and learning from them, in a two-way interactive format, rather than be a big-time, famous media star who too often lets his fame go to his head, and starts to have ego problems. This graph comes from Intelliseek'sblogpulse. It scans all the blog sites it is aware of and graphs the hits for a key word or phrase as a percent of all its blog posts. When I visited, it had discovered 11,254,702 blogs (hmm ... a million more than Sifry's Alerts announced a few days ago. 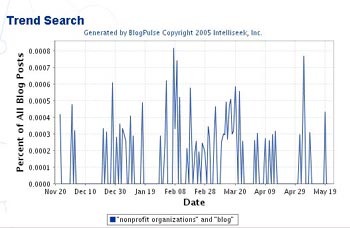 This graph answers the question: What is the percentage of total blog posts that mention the words "nonprofit organizations" and "blogs"? What has been the trend over the last six months? FI Space is a dynamic journal for the discussion of the future, innovation and change pertaining to the American Cancer Society. A dialogue about these topics has been occurring among the members of the Society's Futuring and Innovation Center (FICenter) for some time. FI Space was created to open participation in the discussion to staff and volunteers. Recently I came across a metaphorm for the blogosphere, Blog-poly: a game of monopoly. I started to wonder about what an appropriate metaphorm for the nonprofit sector of blogosphere might be. But, before I could even begin to play with that idea, I need to blog some examples of nonprofit blogging. Go Bob for blazing a trail! We could all learn from what he's doing and I'm hoping he will provide additional comments/posts about the effort (Bob - do you have a personal blog? If not, please comment here). I'm curious to know about management of the blog (from a time/resource perspective), having a blog that's driven by the organization versus unsolicited supporters/volunteers (the pros and cons, the opportunities and challenges of posts coming from the organization), adoption by the local and national organization, feedback from bloggers/traffic, any measured ROI, etc. Anything you can and will share, I would love to know. In the comments section, Bob answers her post. He describes how the blog got started, that he doesn't have a personal blog, and that one challenge is: "Always remembering that I am speaking not just for myself, but for the respected nonprofit health charity I work for, is sometimes a challenge" He also describes how he has established a habit of blogging daily or almost daily and the audience for blog is growing. "Visits on this new blog have steadily grown from approximately 400 last month to 900 this month." Seems like the American Lung Association of Minnesota has discovered the right tool for the job as per Deborah Finn's recent musings on nonprofits and blogging. Bob, how do staff and the leadership within your organization view the use of a blog as a tool for the organization's communication strategy? How did you introduce the concept of blogging to your ED? What did you lay out as the benefits/risks? Or did you just do it? And questions for both Lisa and Bob -- What are your impressions of the nonprofit blogosphere? What does it look like? I'm going to blogher conference! Got childcare lined up and found a cheap flight. I'm going! Now all I have to do is figure out how to make this image show up on of my side bars! I am killing two birds with one stone so to speak. 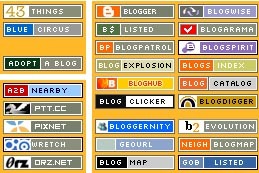 This is a really cool "Sticker Map" of all those blog stickers that someone found. Sort like the vintage luggage tags. The above is one section and each sticker is linkable to the blog. I'm also fooling around with ECTO that Michael Gilbert mentioned in his article about weblog publishing workflow, although he uses a different tool called Marsedit. which is only available on MAC. ECTO is in Sonny Cloward's tool box and Julie Leung is experimenting with this nifty tool and it has a windows version. So I downloaded the trial and exploring it with this entry. I can already see where it eliminates some of the annoying problems that I have encountered with the typepad editor. The one drawback (not for me) but if I'm working with less technically savvy users -- it isn't WYSIWYG - so the initial experience may be offputting. Probably a tool to introduce after they have been blogging and find the built-in editor annoying or inefficient. Via Plasticbag I found the link to "Blog-poly" which metaphorms the blogosphere into a monopoly board. This was created by a Norwegian who is a creative thinker and has a site called Little Oslo. It is fun to use the board to lay out the Blogosphere Ecosystem. 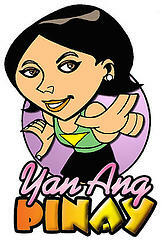 It helps me to think and learn about blogging culture by transforming the original game into this version. I had to think about which company and enterprise to choose and set up first on the board. The space is limited, so I picked well known names in blogging industry. Besides the private properties, there are two public utilities--the water works and the electric company. Then I thought of "Wikipedia" and "Creative Commons", and then a few more, making "criminal" into "spammer", "free parking" into "free hosting". "Chance" and "community chest" become "comment" and "trackback". Fun -- yes? There is not much difference for me transforming the game than writing a poem, using similes, metaphors and symbols. If we created a monopoly board for nonprofit blogland, I wonder what it would look like? Blogpoly is not the only Monopoly inspired by blogging. In the Cambodian Blogosphere, expat Mr. Guy (a wonderful photographer and writer), got some help from others in fleshing out his idea of a Khmer version of monopoly. Monopoly has special meaning to me because I grew up in Atlantic City and lived down the street from Marvin Gardens (one of the yellow properties.) 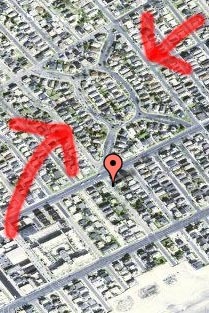 Marvin Gardens is between the red arrows. My house is where the red balloon is. Digital Prayer Wheels: Is that What We Need To Keep Some Nonprofit Organizations Motivated To Blog? I sent the link to Art Mobs to one of the museum/tech lists I'm on because I wanted to see if there were other examples of blogging in a museum context. Julian from Pacific Asian Museum left a comment that pointed to a blog about Buddhist Art Happenings Around the World. (I got excited because I had been researching buddhism and art resources for Cambodia4kids and because the monk from the Wat in RI might do some culture classes for Harry and Sara and some other kids... ) Unfortunately, the blog postings stopped around a year ago, not sure if that's because the blogger left the organization, lost enthusiasm, or there haven't been any buddhist art happening around the world. Aside from the great pointers to art exhibitions, I found a site that teaches zen meditation and a possible bar and bat mitvah gifts for Harry and Sara when they turn 13. But even better, was the digital prayer wheel, "Digital Prayer Wheels praying with electrons you already have around the house." Here's more about analog prayer wheels. I got curious and emailed Julian asking him why postings haven't continued. His response: "We've been extremely swamped with work, which has made us realize that if you are going to do something like this, you have to be prepared to manage it. There are several options in discussion now on how we might use this blog to our advantage and increase it's userability. I'll keep you posted on our decision and our findings. " I'm sure that out of the 10 million blogs counted by Sifrey, there are certainly some that aren't active. It is human after all. I stopped blogging for six months, although I don't think anyone noticed. The point is that the activity of blogging (not just the posting, but the discoverability) is a habit and creating a habit is about change or a transition. So, how do you keep motivated? I decided to join the Thursday evening blogger list and hope to make it to the meetings. But, found this interesting example of using this new technology to make art more accessible ... Makes me wish we lived in New York or that it could be done for MFA in Boston. “Art Mobs” is a project designed by students in Dr. David Gilbert’sOrganizational Communication course at Marymount Manhattan College in New York City. For Spring Semester, Gilbert’s students have produced unofficial audio guides for the Museum of Modern Art and made them available on the Web as podcasts. They are inviting the public to submit homemade audio guides to their podcast feed, which the students hope to make a permanent distribution system for audio guides that anyone can produce, share, transfer to an iPod or other MP3 player and take into MoMA. Mobs is an ongoing project for Organizational Communication studentsin the Department of Communication Arts at Marymount Manhattan College. There's lot of articles about the project and related to the concept in Gilbert's delicious account. From Sifry's Alerts, Technorati tracked its 10 Millionth Blog (a chinese glassblower). What I wonder, what percentage of the blogs are active? Anyway, he provides a list of influencers of the blogosphere. Ed Batista answered my musing about feeling naked online (in the context of getting over the discomfort one feels as blog writer) with a great response and an interesting photo. His key point is about weighing the risks exposure against the risks of invisibility and setting some limits. Thanks Ed! And, I stumbled upon the blogher conference with a session entitled "How To Get Naked Online" in July. Hmm ..
UPDATE: I came back into my office this rainy Saturday morning to wrap the gift for my daughter's friend's 4th B-day party this afternoon and made the mistake of checking email. Julie Lueng left a comment and just had to follow it back to her blog and found her entry - "The Veil: Not Nake Yet." I'm blogging it here to mull over later. The word naked has been used to describe blogging in a couple recent examples that come to mind. I'm looking forward to attending the How to Be Naked session at BlogHer where bloggers will share how they handle revealing aspects of their personal lives on-line. Robert Scoble and Shel Israel have titled their book-in-progress Naked Conversations. However I would argue that blogging is not nakedness. Conversations come from social context [for example, read danah boyd's work] . Who we are changes depending on where we are. Out in public space, none of us can afford to be naked. There are words we don't write, emotions we can't show, experiences and beliefs we hide from view. We are aching for the real, wrote Evelyn Rodriguez. We long to be intimate with each other. To be who we are. We long for truth. We long to touch. Blogging allows us to come close - to come close to each other and to ourselves. If we are brave, we can type and say the insides of our souls for the world to see. But yet, I believe, there is always a veil. I want to clarify my point with contrast: Blogging is real. Contrary to New Yorker jokes, I am not a dog on the other side of this screen. I am no mystery. I am me. And I am offering myself. I am seeking connection and finding it.